People prepare for weeks and months before the day of an exam. They know that this day is consequential, and that what happens will affect them for a long time to come. Is Ramadan not more important? Won’t its effects last for eternity? Knowledge of the ins and outs of Ramadan and fasting is essential to gain the maximum benefit from this month. 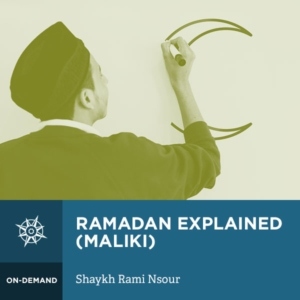 This lesson set is perfect to learn how to properly appreciate and navigate Ramadan. “The Messenger of Allah (sal Allahu alayhi wa sallam) said, “People are ores like the ores of gold and silver. The best of them in jahiliyya are the best of them in Islam if they gain fiqh (understanding).” We should not see in ourselves and others what is immediately apparent, but rather look for the potential that can be attained. This potential is unlocked through knowledge of Islam.” Rami Nsour was born in Amman, Jordan and moved to the United States at the age of 9. During his college years, he attended classes taught by shuyukh in the San Francisco Bay Area; notably, Shaykh Khatri bin Bayba, Shaykh Abdullah bin Ahmedna and Shaykh Hamza Yusuf. With their encouragement, Rami embarked on a journey to Mauritania in 1998.In Mauritania, he studied with some of the greatest scholars of our times such as his foremost, Shaykh Murabit al Hajj bin Fahfu. He was also blessed to study with Murabit Muhammad al-Amin bin al-Shaykh, Murabit Ahmed Fal bin Ahmedna, Shaykh Abdullah bin Ahmedna, Shaykh Tahir ibn Murabit al Hajj and Shaykh Sa’d Bu among others.Rami completed studies in the subjects of Qu’ran, ‘Aqeedah (Belief), Fiqh (Law), Nahu (grammar), Ihsan (spiritual purification), and adab (manners). He has completed the final text of Maliki fiqh, Mukhtasar Khalil, with memorization and has been granted permission by his shuyukh to teach. In addition to his extensive study of fiqh, he was afforded the unique opportunity to attend one on-one sessions with his teachers where he would engage them in countless hours of discussion on the application of fiqh in general and specifically for those living in the West. Rami has translated traditional Islamic texts from Arabic including various works on Maliki fiqh and several works of the great Mauritanian scholar, Shaykh Muhammad Mawlud, including Birr al-Walidayan (The Rights of Parents), Ishraq al-Qarar (The Spiritual Aspects of Prayer), and the Adab of Sadaqa. He has also translated a versified version of Adab of the Student entitled Iya’ant al Mutafahim (The Assistance of the Student) by Shaykh Muhammad al Hasan as well as the original Taleem al Muta’llim by Shaykh Zarnuji. In addition, Rami has dedicated much of his time in teaching, conducting seminars and counseling. He has spent a great deal of his time teaching and aiding Muslims in prison and has seen how knowledge unlocks the human potential. His students in the prisons have in turn taught countless people and invited many people to Islam. He was instrumental in co-founding Dar as-Salaam, a project dedicated to building and supporting a school in Mauritania.Shaykh Rami serves as Senior Instructor at SeekersHub Global. Rami is the co-founder of the Tayba Foundation which has a correspondence program for Muslim inmates (http://www.taybafoundation.org/). In addition to traditional teaching licenses (ijazah), Rami holds a B.A. in Human Development with a Focus on Early Childhood. Rami resides in the San Francisco Bay Area, is married and has two children.